After witnessing her mother being assaulted in a Cambodian refugee camp, six-year-old Laura Som became traumatized. “I found my mother beaten to near death, convulsing in her own pool of blood… For twenty years I had nightmares of that moment,” Som said. When Som ended up in an orphanage after her mother abandoned her, she learned the art of meditation, a practice that would change the course of Som’s life, empowering her to cope with her trauma symptoms. Today, as the executive director of the MAYE (Meditation Agriculture Yoga Education) Center, Som shares those self-healing methods with trauma victims throughout the city of Long Beach. Living in the present moment is difficult for trauma victims grappling with a damaging past, explained Som. Meditation, yoga, and working in the garden are great tools to cultivate focus on breathing, movement, and awareness of the present moment, she said. Som’s trauma is what she calls intergenerational; her mother passed it down after the Khmer Rouge massacre. “My mother was so traumatized by the Khmer Rouge, that she herself didn’t believe in love or family,” said Som, who believes trauma led to her mother’s decision to abandon her in Cambodia when she was six-years-old. Som and her mother eventually made it to Long Beach where their trauma found a new home — among other Cambodians’ trauma. “I experienced domestic violence… I may have gone to seven schools in one year,” Som said. Som and her mother were victims of abuse, became homeless, and Som eventually had to raise herself. Outdoor Meditation at the MAYE Center. But, by practicing some of the key elements in the MAYE concept, Laura Som was able to overcome her trauma. She attended Long Beach Poly High School, and graduated with a 4.0 grade point average, eventually becoming a biochemist. Now living a much more stable life, Som has created the MAYE concept, and established a center to practice it, on 2153 E. Anaheim St., in Long Beach. The center serves many Cambodians in Long Beach, who have also suffered from intergenerational trauma stemming from the Khmer Rouge massacre. 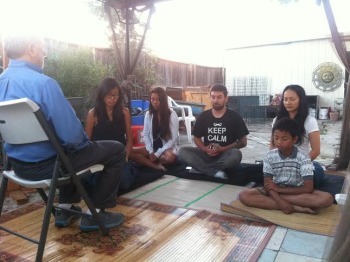 The MAYE Center, not exclusive to Cambodians, is a place where Long Beach residents can learn ways to heal and thrive in the present moment, despite the diversity of traumatic events they have experienced. “What we have done is created a cross-cultural connection, a healing where different cultures come together and learn from each other,” Som said. trauma victims are not “emotionally ready” for the MAYE techniques. In those cases, Som refers them to the Long Beach Trauma Recovery Center or The Children’s Clinic. The Long Beach Trauma Recovery Center which opened in late April, is an alternative solution for trauma, only the second of its kind in California. A joint effort between CSULB and St. Mary Medical Center, the LBTRC offers counseling, therapy, and a highly specialized team of experts on trauma recovery–something very rare in most counseling centers. Before the center opened, victims of trauma were referred to traditional community clinics, private practitioners, or general counseling centers, according to Dr. Bita Ghafoori, the center’s director and CSULB professor of Advanced Studies in Education and Counseling. Ghafoori said that research shows people are generally not dealing with trauma, and when they do, are unsatisfied by the centers they go to for help. “A big problem in our society is that we have a lack of resources and trained professionals, for individuals who’ve experienced violence and trauma,” said Ghafoori, noting that this is not the case at the LBTRC, where all of the staff has expertise and extensive training in complex and chronic trauma. “This is all we do. We study this population, we work with this population, and we have a very comprehensive approach,” Ghafoori said. All services are free to anyone who has experienced at least one traumatic event in the last three years, covered by the California Victim’s Compensation Program. The center takes walk-ins, does not require any paperwork to be previously filled out, and welcomes derivative victims of trauma and family members as well. Along with these mental health centers treating trauma, The Children’s Clinic, aims to prevent trauma in the earliest stages in Long Beach. TCC has just launched the Every Child Bright Beginnings Initiative, the first project to use toxic stress screenings in routine pre-natal and pediatric medical check-ups. Dr. Elisa Nicholas, pediatrician and chief executive officer of TCC, said that when children’s brains are developing in utero, and between zero and three, ongoing toxic stress can actually change the brain architecture. “As pediatricians and OB, we have this unique opportunity to touch these lives and families before a lot of other systems do,” Nicholas said. Nicholas understands the extent of trauma in Long Beach, and wants to remove the negative stigma with trauma in a family or home. TCC is still in the beginning phases of the project and now looks forward to interventions, and patient care such as parenting classes, home visits, and nutrition and health classes. Elgin is a journalism student at CSULB.